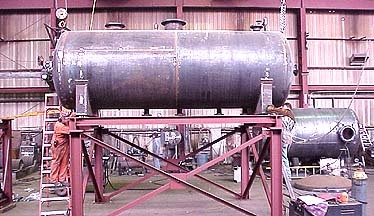 Kansas City Deaerator’s Boiler Feed Systems can be used in applications when a deaerator is not feasible and/or desirable. In addition, the systems can be equipped with low pressure pumps and utilized as a condensate receiver. Boiler Feed Systems should be sized to allow adequate storage volume for anticipated surges and to ensure sufficient reserves while plan controls react to changing. Available in simplex, duplex, triplex or quadroplex up to 125,000 square feet or 1,000 boiler horsepower. Assembled and pre-wired to the extent possible for shipping. Rugged heavy duty centrifugal pumps with low NPSH. Receivers up to 1,000 gallons as standards with custom receivers to any size. Single condensate return units are equipped with a 2-pole, heavy-duty float switch activated by a float. The entire switch mechanism including flange, float and rod is mounted on end of receiver, and it can be removed as a complete unit. The mechanism is readily adjustable for various water levels without removal from the receiver. Duplex return units are equipped with a mechanical alternating float switch which alternates the operation of two pumping unit in successive cycles. It consists of two 2-pole switch units in one enclosure, and is operated by one float within the receiver. This device not only alternates the pumping units, but also automatically starts the second pump in case the first pump fails to start or to carry the loan. Tappings for gauge glass and thermometer are standard on all H Series receiver tanks. Control cabinet – duplex includes magnetic starters with reset buttons and third leg overload protection for three-phase. Two hand-off automatic selector information reference bulletin ACC-700. Single and duplex boiler feed units are equipped with a heavy duty float operated makeup valve actuated by a float. The entire mechanism including flange, float and rod is mounted on the end of receiver. It can be removed as a complete unit and is readily adjustable for various water levels. Tappings for gauge glass and thermometer are standard on all H series receiver tanks. Control cabinet – duplex includes two started switches, two reset buttons and third leg overload protection for three-phase. Two hand-off automatic selector switches are optional. Other electrical options are available, see bulletin ACC-700 for additional information.